CES is an annual event showcasing Consumer Electronics. And in 2016 it is bigger with some exciting new tech on display. 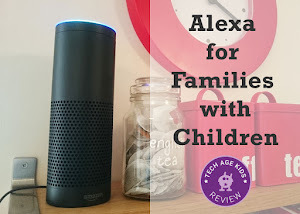 Although we've not been there, Tech Age Kids have put together a roundup of the tech we liked and think would be fun and awesome for kids and families. Some things are a bit quirky and many are still in development, so don't always make it to market. Nonetheless it's the place to see all the trends and where the industry is heading. There's plenty of consumer tech to get excited about in 2016. A startup ourselves, it's pretty exciting to see many startup companies exhibiting at CES 2016, some of which we've seen as crowdfunding projects last year. It is truly inspirational for kids today to see what is being developed in the Technology World and give themselves over to their dreams to imagine what the future could be. The show this year covered the size of 50 football fields, that is a lot of tech to admire. In this roundup we'll look at tech for kids and families in these categories: Robots, Toys, Wearables, and Drones. One of the most exciting robotic toys at CES, created specifically with kids in mind, is the Ziro Robotics Kit by Zero UI. Aimed at 7 years and up, you build a robot using a modular system with hinge and rota parts. Then control the robot by pairing the modules through a smartphone app with a glove. Now you control the robot you made using your hand! 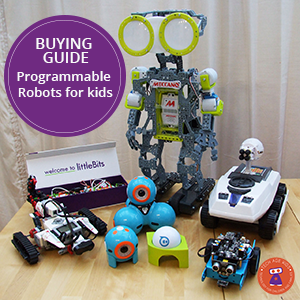 I already know my kids will love this kit and the creativity it offers in designing your own robot. The company claims you don't need to know how to code to use the kit and control the robots. At present there isn't a retail price set and the product will launch as a crowdfunding project on Indiegogo in January. BB8 was a mega star in the latest Star Wars movie, The Force Awakens and Sphero have come up with a perfect wearable for the popular little robot. They call it the Force Band and it allows you to controll Sphero BB8 using a wearable featuring gestured based technology. You tell me me what kid wouldn't like to control their BB8 robot using Jedi-like movements. We're really excited about the new LEGO WeDo 2.0 kit. It was about time for LEGO to launch an upgrade to the WeDo robotics and programming kit, which is widely used by primary or elementary schools. Read our review of the difference between LEGO WeDo 2.0 and 1.0. Our favourite big robot - Meccanoid G15 got an upgrade at CES 2016. The Meccanoid G16 (& G16 KS - Kid Size) were unveiled for this year with twice as much brain power, more robotic intelligence, faster voice recognition, additional programming ability and interactive features. Spinmaster also announced a Dino version of Meccanoid called Meccasaur T-Rex to delight any dinosaur loving kid. There's also three Micronoids priced at $39.99 which will allow kids to program on a smaller scale and see the robots interact with each other. This is a super cool robotic pet, currently available on crowdfunding site Indiegogo or as pre-order, set to ship in July 2016. The question is how does it compare with a real doggie pet, and from what I can see so far, this may be an ideal option for kids wanting a pet but parents not wanting the mess. It uses artificial intelligence and is loaded with all kinds of sensors to make it feel like a real pet dog. The owner wears a band which interacts with CHiP and the robot learns as you play with it. Check out the video, we think CHiP is awesome. I wonder what Ruby will think? This little yellow duck is no ordinary duck and it's won a few awards at CES 2016. Edwin the duck is a toy, a music player, a night light, a friend that is waterproof and interacts with apps on your smart devices. It's a connected toy developed to grow with your child and recommended from age 3 and up. Leka is a social robot designed for kids with autism learn new skills. It provides sensory stimulation through lights, vibration and sound claiming to make learning and social interaction easier. Another crowdfunded project, this French company likens Leka to a "guide dog" for children with the condition. It can be used as a tool to help parents and caregivers teach their kids through play in their own homes. The little round robot is part of emerging technologies used to help children learn. Now Available on Indiegogo via Crowdfunding Campaign. Fisher-Price is making sure the youngest of kids can learn to code, with this cute new toy called Code-a-pillar. There are 8 modules that snap together and each has a different function. The caterpillar will move and make sounds in the order which you've plugged the modules together. Similar to other coding games like Robot Turtles, Code-a-Pillar introduces preschoolers to logic thinking needed for computer programming. It will be available from June, retail for $50 and recommended for kids aged 3 - 8. We love toys, kids can make and programme and really excited about the launch of Hackaball. On the surface Hackaball looks like a typical ball toy, but inside is a 6-axis motion sensor and multi-coloured LEDs. 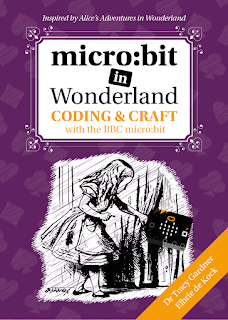 Kids are encouraged to programme their own games and at the same time learn the basics of programming. Hackaball is another successful crowdfunding project and will hit the shops in March at $85. We are seeing more toys come to market that interact with apps on tablets, and Smart Letters from Marbotic is one of them. The wooden letters look like ones you'd traditional build in a wooden puzzle, but these interact with an iPad app and help a young child recognise letters and numbers. Marbotics successfully funded their project on Kickstarter and shipped their first products to backer in December. We love the mix of traditional wooden toys with tech. Well done Marbotics. Below is a really interesting video about the tech behind the concept. Square Panda is collaborating with investor Andre Agassi to bring to market an electronics playset, transforming your iPad into a tool to help kids learn to read. It uses apps and real physical letters to engage the child. The play set with 45 letters is targeted at ages 3 and up and available from April 2016 at $99. The robot by xyzPrinting looks exciting for maker families with 3D printers, as you can change its look by 3D printing your own parts. If you're a parent wishing for your kids to make their own toys, this robot is great. Free downloadable motion scripts are available to use with the robot and users can design different parts for the robot with a 3D printer. XYZprinting's first 3D printing pen with an expected MSRP of $49 is great for DIY craft projects. This exciting new product has no restrictions on print size and doesn't require a computer or software to use. I've been looking for a quality 3D printing pen, and this may just be it. The Withings Thermo is a smart thermometer with an LED screen that uses an infrared array to take your temperature. You simply point it at your temple. No more under-the-tongue, armpit or rectal insertion needed. Your kids will thank you. Will ship in March at $100. Finally a smart piano, that can actually teach you to play. The One Smart Piano, was unveiled at CES 2016 after a successful crowdfunding campaign on Indiegogo and will retail at $1500 or a keyboard for $300. May this be the end of the piano teacher? da Vinci Mini: This ultra small device will be XYZprinting's most affordable 3D printer yet with an expected MSRP of $269, perfect for the general public. The small, but versatile 3D printer comes with Wi-Fi capabilities and also includes USB ports. Thirty percent smaller than the 2015 da Vinci Junior, this printer maintains the same build size of 5.9"x 5.9"x5.9". It is the ultimate, light-weight desktop 3D printer for those that value desk space, simplicity and portability. da Vinci Junior 1.0 3-in-1: Accessible to a broad range of consumers, educators and hobbyists, the compact da Vinci Junior 1.0 3-in-1 printer, with an expected MSRP of $549, features scanning capabilities and Wi-Fi connectivity. A laser engraving module is also available to consumers as an add-on accessory. By simply pressing a button, its auto-calibration feature allows users to move the da Vinci Junior 3-in-1 extruder around the print bed, while also determining the correct distances between the extruder nozzle and the print bed. This process ensures that each print comes out in the best quality possible. da Vinci Junior 2.0 Mix: Bringing more color to life, the da Vinci Junior 2.0 Mix is capable of blending two colors by using a brand new, dual-extruding single nozzle that combines two filaments to create a print that gradually changes color. The da Vinci Junior 2.0 Mix has an expected MSRP of $499. We like this adorable wearable camera for kids, that is bendable and simple to operate. PIC is a fun wearable used to take pictures and videos on the go. The device is available in a range of colours, with bluetooth connectivity and expected to retail at $150. We know how much kids love to take pictures and PIC looks to offer an easy and flexible way for kids to explore photography. This year we'll see lots of products where tech collides with fashion and function. We bet the Helix Cuff will be a perfect wearable for a fashion conscious tween or teen with smart wireless Bluetooth headphones. The stylish cuff is worn on the wrist and hides the headphones, which wraps around in the cuff. The design is such that it will fit any size wrist. It is available for pre-order at $169. Wearable translator that doesn't need internet connection to work. Currently only available for English, Chinese and Japanese, but living near Europe and loving travelling, I can imagine this device very useful for family holidays. 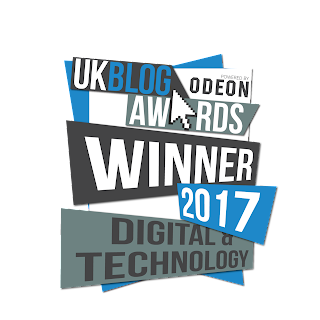 We're so excited about Codrone, as it's at the heart of what we believe at Tech Age Kids, using technology to teach kids to code and get them excited about robotics and drones. CoDrone is a quadcopter that you can easily program using friendly, step-by-step videos. The company behind CoDrone, has just launched a Kickstarter campaign to fund the project. Using the CoDrone curriculum students can learn to code and fly drones. Awesome! PowerUp paperplanes have been around for a while, but now yuo can control your PowerUp FPV using Google Cardboard - VR experience first person flight through a live streaming camera (your mobile) Launched Kickstarter in November. 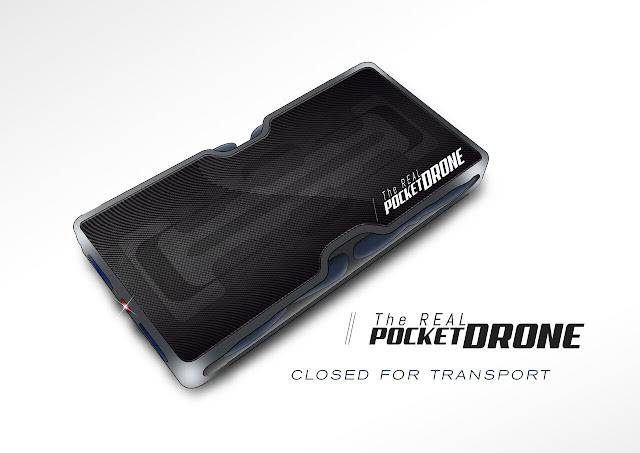 Odessey Toys launched their pocket drone, retail at $129.99. It's a collapsible video drone that folds as small as an iPhone 6 and has WiFi technology, USB charging and LEDs for night time flying which you can use indoors and outdoors. They also have the Starblade Drone which is a quadcopter for indoor and outdoor use, with 40 LEDs and perfect for SciFi fans. Retailing at $129.99 Finally the Turbo Runner NX available at $34, this RC toy transitions between flying and running mode and can perform amazing tricks. All will be available from Feb 2016. Spinmaster is reviving their Air Hogs by making them connected drones and helicopters using augmented reality technology. Air Hogs Connect is a hybrid between a tangible RC toy and digital game. Players fly an actual Air Hogs Quad while engaging in missions and completing goals in the companion video game. The Air Hogs Connect universe is projected in augmented reality through the player's phone or tablet as the Air Hogs Quad interacts with the digital environment, undertaking missions and challenges such as shooting aliens, rescuing people and putting out fires. Retail $200. We're excited about this new drone component to WowWee’s Robotic Enhanced Vehicle battle-game platform. Tracy's kids just got a pair of R.E.V vehicles for Christmas. R.E.V. AIR is app-based and allows you to fly a quadcopter around a battlefield taking on an AI ground vehicle. You can also be chased by an AI quadcopter with the capability to attack, fire virtual missiles and swarm at your maneuverable R.E.V vehicle. WowWee says its BeaconSense technology helps make R.E.V. AIR quadcopter fly autonomously so you can focus on the actual gameplay. R.E.V. AIR will be out in by the end of 2016, WowWee says, for $129.99. The same company also announced an indoor quadcopter that flies itself while you engaged in its app-based gameplay, which includes challenging players to follow sequences of flashing lights and music while LUMI flies and dances in the air. With LUMI, you can record your flight moves and share them on social media. WowWee says LUMI will be available by the end of 2016 for $79.99. CES 2016 has set the tone for the year, a year when new technologies will be entering our homes and our kids are ever more exposed to devices, robots, wearables and tech in every day home-life. I for one am looking forward to the day technology can make some mundane house tasks just a little easier. It's really exciting to see companies continuing to develop products to encourage children to explore technology and also be makers and inventors. Really what CES has done this year to open a world for our kids to explore and develop - a new connected world. I hope as we go further down the track, we will see tech being used for good, to encourage sustainability and collaboration, embrace learning and sharing. Hopefully one year, Tech Age Kids will visit CES in person.